Lauren Conrad; fashion designer, reality TV starlet(The Hills...for those of you completely devoid of current social pop life)...oh and just for fun lets throw in a new one. Author? Yup that is correct. It has been established that miss-drama-reality-fashion-student-gone-designer Lauren Conrad has signed on to write a three-book series. The first book of the series is said to be available June 16th (mark your calender/Blackberry), and is entitled L.A Candy. Creativity will be at its forefront as Lauren really steps outside her comfort zone through her writing. 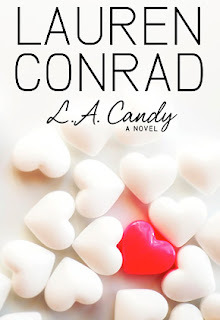 L.A Candy will feature a young girl who moves to L.A and unexpectedly becomes the star of a reality television show. What! I know, I know. Will Lauren be capable of accurately embodying such a foreign lifestyle through the eyes of her literary self...ahhh...I mean her fictional character. To be fair, Lauren did go on to say that the book may have some sections loosely based on her own experiences. Imagine that. I would just like to extend my thanks towards HarperCollins, at least young (who am I kidding... everyone seems to watch it) impressionable girls (pfft, okay I'm sure some guys watch it too- we don't want anyone to feel left out) will now be able to read about the complex issues and dramas faced by those of the young, rich and beautiful. Don't judge a book by its cover, and well maybe in Lauren's case don't judge her based on her expensive designer clothes and/or hit reality TV show, either way despite how L.A Candy works out we will have not one(! ), but two follow up novels to look forward to! You can preorder your copy now.. m. little notes: -it seems to only be available in hardcover. that makes it legit, right? - on Amazon.ca, currently the only listed "tag" is polygamy - why! - I did read somewhere that someone ghosted for her, and that they did a pretty good job. I am not sure if there is truth to that or not...here's to hoping. - to be fair I dig the bathing suit.